Journal of Chemistry and Allied Research is a peer-reviewed, Open Access journal that is aimed to publish original research articles as well as review articles on all the sub-divisions of chemistry. 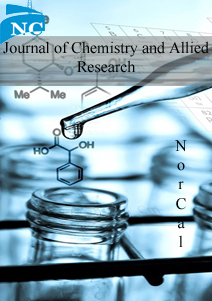 NorCal Journal of Chemistry and Allied Research accepts and publishes papers on all aspects of fundamental and applied chemistry. The journal is broad in scope and welcomes submissions from a range of disciplines and sub – disciplines like Pharmaceutical, Biological activities of Synthetic Drugs, Environmental Chemistry, Biochemistry, Polymer Chemistry, Petroleum Chemistry, and Agricultural Chemistry, etc. The journal reports both theoretical and experimental studies. The journal encourages submissions from outside and in between the traditional subject areas and interdisciplinary articles, with an emphasis on chemistry. The journal also considers manuscripts from chemistry inter-related branches like agricultural chemistry, food industry, bio chemistry, etc. In addition to original research, our journal also publishes review articles, mini-reviews, case reports, editorials, etc. which aid to the development and new innovations of the chemical fields.